With Zender, the relationships we develop extend beyond the Sales experience. We have a great number of resources on our site to help you with the shopping experience in the first place! We also take trade-ins to give our customers the opportunity to upgrade their vehicle to a new Ford or a used vehicle from a number of other manufacturers. And to make buying a vehicle so much more accessible, we also offer a variety of financing options along with a number of service plans to help you protect your purchase. Throughout your ownership experience, we’ll offer you our shuttle service to get you to work, and back into the shop for your service appointments. Speaking of servicing, we’ve also got a variety of quick lane services for quick, drive-through-like service. Additionally, it wouldn’t truly be comprehensive service without collision repair too. We work closely with Fix Auto Collision Repair when addressing our customer’s auto repair needs. Don’t just take our word for it; take the word of our customers and critics. DealerRater’s Dealer of the Year Award Program recognized us this year for next-level customer satisfaction, as expressed by dealer reviews on the site. We like to consider this award proof of our dedication to our customers–proof of the Zender Ford Advantage. If you have any questions for us or need more convincing of why you should make us your dealership of choice, then feel free to contact us to speak with one of our friendly representatives. 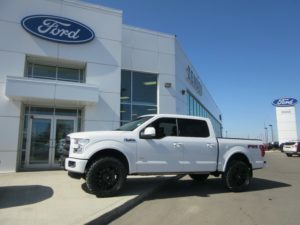 We welcome you to meet us in person too, where you can get the best taste of what it’s like to deal with Zender, one of the best Ford dealers in Alberta!